Below you can view all the condos for sale in the Wild Dunes Resort subdivision located in Isle Of Palms South Carolina. 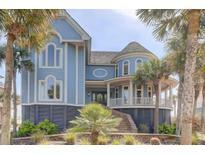 Listings in Wild Dunes Resort are updated daily from data we receive from the Charleston multiple listing service. To learn more about any of these condos or to receive custom notifications when a new property is listed for sale in Wild Dunes Resort, give us a call at 843-306-2224. All info deemed true please verify MLS#19007765. Carolina One Real Estate. Endless views to go along with the many Wild Dunes amenities', at an amazing new price. MLS#19006997. Beachside Real Estate. This house was built by Saltwater Homes, the 2017 Custom Home Builder of the year. MLS#19005887. Agentowned Preferred Group In. Sold fully equipped just in time for the upcoming rental season. MLS#19005847. Wild Dunes Real Estate, Llc. This is a paradise you must see...use it for yourself and/or rent it short term for an amazing cash flow opportunity! MLS#19004307. The Litchfield Company Real Estate. 22 windows replaced 2017.New stove/oven and dishwasher. Recently painted interior. MLS#18024069. Exp Realty Llc.